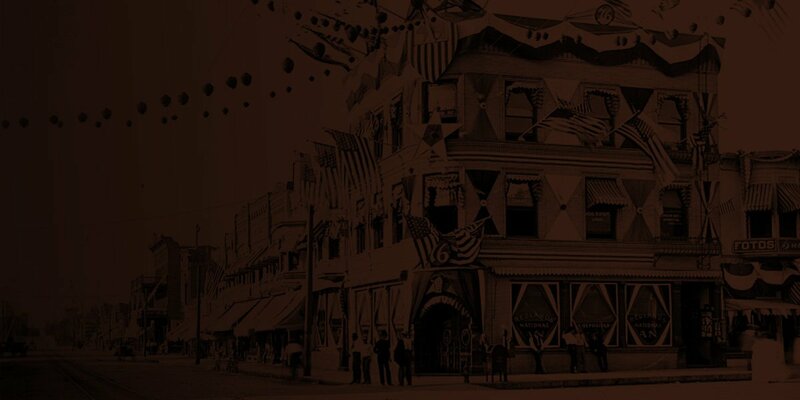 Through the influence of a New Hampshire neighbor, Frank P. Meserve arrived in Redlands on September 10, 1888, and almost immediately opened the “Meserve Clothing House.” The following year Meserve and his wife, Minnie, had a comfortable home constructed on 2 ½ acres of land just west of the planned center of town, Cypress & Center. Myron Sherman built the house at 816 W. Cypress for an estimated cost of $2200. After four expansions of his business, Frank Meserve and that same New Hampshire neighbor, Dr. C.A. Sanborn, had the Sanborn-Meserve block built in 1891 where it still stands on 108 – 112 Orange Street. The Golden Jubilee of Redlands, published in 1938 states, “No man living has played a more prominent part in the development of Redlands than Frank P. Meserve.” Mr. Meserve was a director of Union Bank, Redlands Light & Power Co, and Redlands Preserving Co.; he served on the Board of Trustees (city council) and was the first president of the Redlands Library Association. He also sat on the school board and supported bringing the University to Redlands while a member of the Board of Trade (Chamber of Commerce). He later became the county assessor, deputy collector of Internal Revenue and a member of the California legislature during 1899 and 1900. He was the city police judge when he retired in 1937. Meserve was a member of nearly all of the secret societies in Redlands. He was a 32nd degree Mason and first master of the Masonic lodge. He was one of the organizers of the Knights of Pythias, first exalted ruler of the Elks, a past noble grand of the Odd Fellows and past council commander of the Woodmen of the World. Mrs. Meserve was in poor health when they lived in Hawaii for three months in 1895. Later they took a trip to Alaska, but Mrs. Meserve died in 1899. Meserve then traveled around the world touring the British Isles, the continent, India, Egypt, Japan, China and the Philippines. Upon his return he became manager of the Redlands Gas Company. Meserve and his second wife, Helen, raised their four children in the home and lived there until 1938. Frank Pierce Meserve died in November 1943, less than a month shy of his 91st birthday. He is buried at Hillside Memorial Park in Redlands. The house was subsequently occupied by a series of owners, including Jim Reedy of the Reedy Oil Company and the Hardy family – before it was purchased in 1999 by Tom and Judith Hunt. The Hunts have two children, Rebecca and Joshua. Judith is a member of the Historic and Scenic Preservation Commission and a past president of Redlands Area Historical Society. This two-story Queen Anne home has a cross-gabled design and features a steeply-pitched, hipped roof with a large front-facing center gable. The front gable is graced with a multi-paned sash window with vertical boards and octagon shingles. There is horizontal board siding on the upper and lower levels. An asymmetrical full-width “L” – shaped front porch which wraps around the east wall is supported by seven turned-spindle redwood porch supports. There are doors to the interior on the west and east sides of the porch. The east elevation features a large pane window bounded by smaller panes. Other gables are Eastlake in style and heavily ornamented with medallions, brackets & decorative shingles. The north elevation has an unusual double gable with cut out sunburst. Horseshoe trusses are seen on the upper north and west gables. The interior chimney is brick. The foundation is of cement block and is not original to the structure. Previous owners, the Hardy family, did much of the cement work and subdivided the parcel which is now a half acre. The original roof cresting, quoins, Eastlake spindle work and brackets are gone but the beauty of the home and grounds remains. 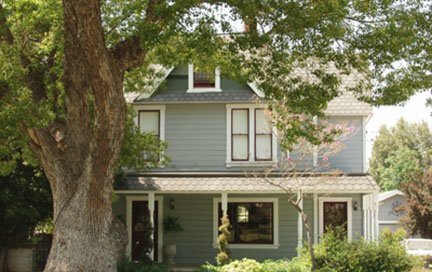 The Redlands Area Historical Society is pleased to recognize the current owners, Tom and Judith Hunt, for their hard work and love of this historic Redlands property.